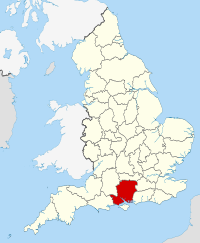 Hampshire ( i/ˈhæmpʃɪər/ or /ˈhæmpʃər/; abbreviatit Hants) is a coonty on the soothren coast o Ingland in the Unitit Kinrick. The coonty toun o Hampshire is Winchester, the umwhile caipital ceety o Ingland. Hampshire is the maist populous ceremonial coonty in the Unitit Kinrick an if excludin newly formit metropolitan coonties such as the Wast Midlands, Hampshire wad be the maist populous coonty in the whole o the Unitit Kinrick. Hampshire is notable for hoosin the birthplaces o the Ryal Navy, Breetish Airmy, an Ryal Air Force. The ceremonial coonty borders Dorset tae the wast, Wiltshire tae the north-wast, Berkshire tae the north, Surrey tae the north-east, an Wast Sussex tae the east. The soothren boondary is the coastline o the Inglis Channel an the Solent, facin the Isle o Wight. Wikimedia Commons haes media relatit tae Hampshire. This page wis last eeditit on 3 Januar 2017, at 18:45.